Modernize accounts payable and mass supplier payment processes to scale at the speed of global business. 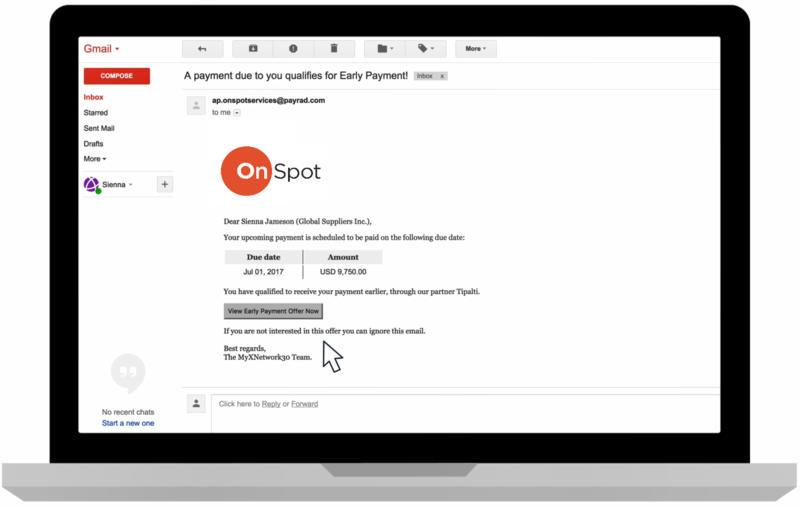 Tipalti’s revolutionary approach to mass payments and accounts payable software can save you hours of manual effort per week. Wipe out 80% of your workload - Cut the manual work and align resources to focus on revenue growth and cash flow management instead of back-office financial operations. Scale rapidly without adding more staff - Tipalti’s end-to-end AP workflow automation provides the infrastructure for long-term success, so you don’t have to keep throwing more resources at it as you grow. Eliminate financial and compliance risk - KPMG-certified FATCA tax compliance, ongoing OFAC and AML screening, audit trails, and role-based views are just a few of the governance capabilities to mitigate risk and fraud – and ensure compliance. Attract and retain your best partners - Tipalti provides a best-in-class supplier payment experience, delivering a white-labeled supplier management experience with global coverage, rich payment method choice, and unparalleled supplier visibility. Tipalti is the only end-to-end solution to automate the entire global payables operation in a unified cloud platform. We take the pain out of payables by cutting 80% of the workload, freeing up your team to focus on growth initiatives. We also provide the systems infrastructure to scale, with robust tax and regulatory compliance built in and financial controls to govern your AP operations. We do all of this while maintaining 98% customer satisfaction and work with leading companies like Google, Amazon Twitch, Houzz, Twitter, GoPro, and GoDaddy. We ensure success with dedicated service and support, and with more than 3 million suppliers around the world, we’re ready to drive your success. 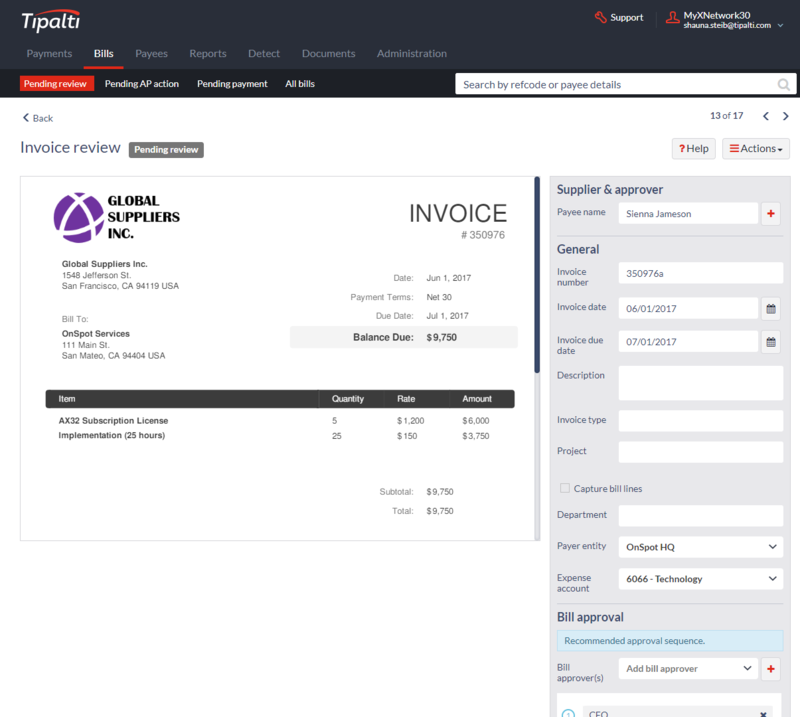 Tipalti provides accounts payable teams a complete global B2B payables automation solution that makes it painless to process invoices, match purchase orders to receipts and invoices, and pay suppliers and partners around the world. Wipe out 80% of your AP and supplier payment workload. Tipalti cuts the manual work from your accounts payable processes, so you can focus on revenue growth and cash flow management instead of back-office financial operations. Tipalti provides the infrastructure that sets you up for long-term sustainability, so you’ll never have to implement another AP system. Help reduce tax, regulatory, and financial control risk. Built-in audit logs, OFAC and other sanctions screening before every payment is processed, signatory rights, role-based views and privileges, robust workflow approvals, and W-9/W-8 digitized tax form collection and validation help mitigate risk and fraud. Generate revenue for AP. Early payment referral fees give AP revenue sharing opportunities and allow companies to manage cash flow better without impacting working capital. Improve supplier relationships. Offer a broad range of global payment methods and currencies, improve payment accuracy and timeliness, give early payment discounts, and provide proactive supplier visibility to payment status and history to enhance the supplier payment experience. Tipalti’s enterprise-grade cloud platform meets the highest level of security standards with extended user roles, approval workflow, and data protection. Tipalti’s systems are PCI and SSAE16 SOC audit certified. AES encryption and white-listing ensure payer and supplier information is maintained to the highest industry security levels. 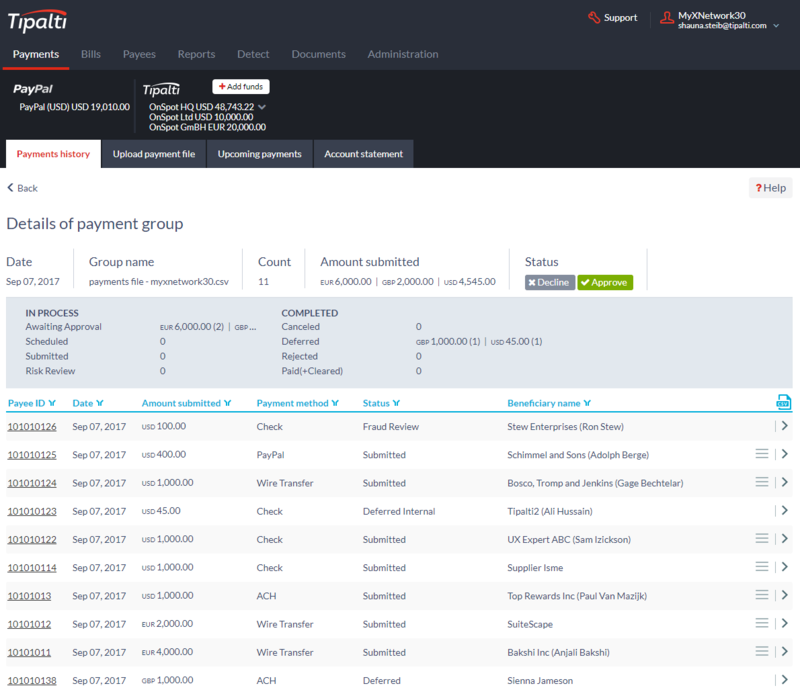 Tipalti is unique in its ability to comprehensively manage and execute global mass supplier payments to partners. 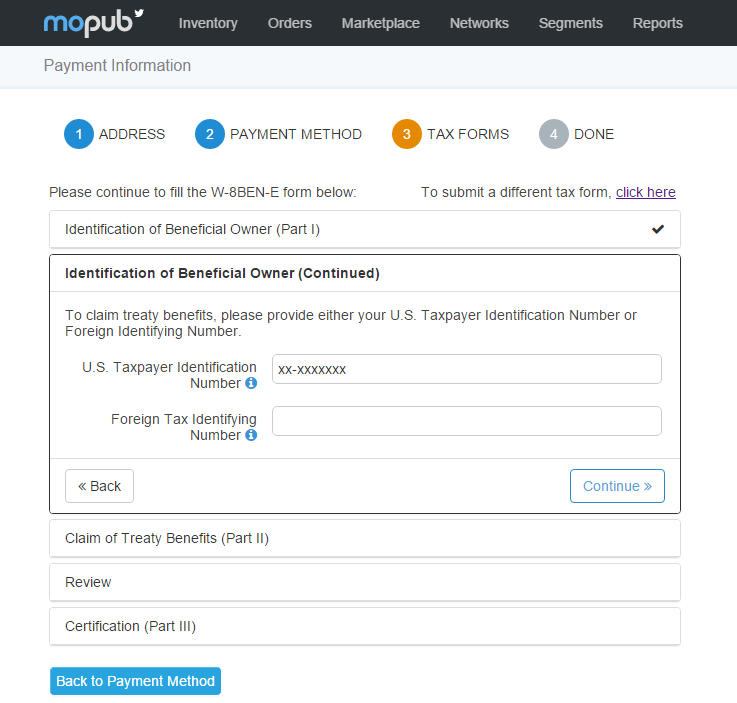 We focus solely on outbound B2B payments including payee onboarding and verification, compliance with fraud (anti-money laundering policies, OFAC) and streamlining tax data collection (including W8 and W9). 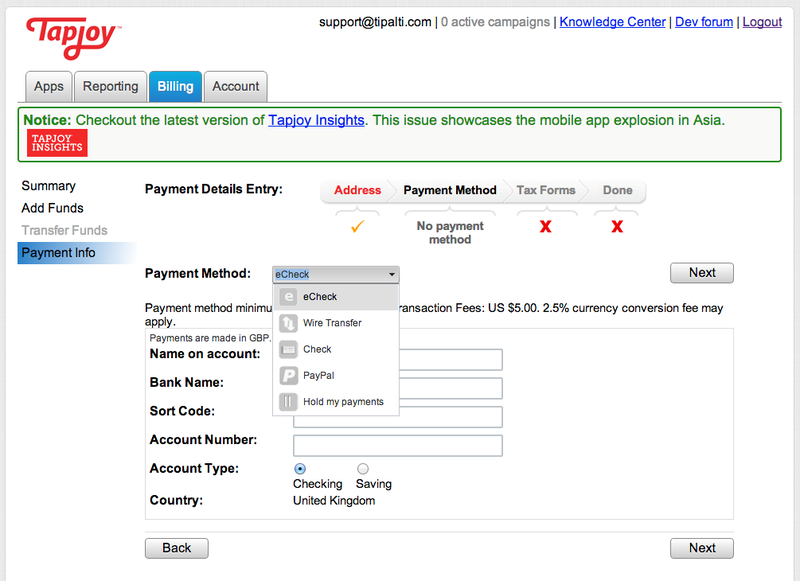 Tipalti supports multiple payment methods (e.g. wire transfers, ACH, global ACH, PayPal, etc.) and delivery in local currency. 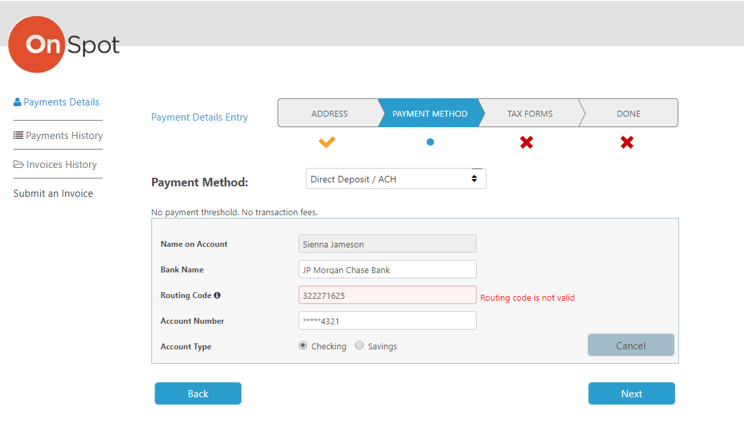 A simple integration with your website creates a custom portal for partners to apply, view and resolve payment issues. Hi there! Are you looking to implement a solution like Tipalti?